When I was in primary school, I was a voracious reader but I hated writing, it felt like a tortuous exercise as bad as my visit to the dentist when drills were like pneumatic hammers, to fix the badly chipped teeth I acquired as a result of misadventure. I remember the first serious essay I wrote was about our class 4 excursion to the National Veterinary Research Institute at Vom, it was interminable with minutiae that left the teacher flustered; it was down to the detail of flies on the hides of sows in the piggery, I had recorded a film in words. When it came to examinations, my dislike for writing was most evident, I wrote the shortest answers, used the least amount of paper, and I was out of the examination hall just a little over half the allotted time for the examination. It was later in secondary school that first, a writing competition where I won the second prize and the interest in forming a press club kindled seeing the value of expressing my thoughts in writing beyond the articulacy of my speech. However, I did not do much writing; I did more song writing and eventually gave my album of about 30 songs freely to a group that believed they were going somewhere, because I simply had no need for the material again. I was up to lots of mischief in from late secondary school into my political polytechnic days, writing under the pseudonyms of Philip Bucknor of the Bucknor & Bucknor Chambers of Inquiry along with my partner Larry Bucknor and Who Else later on. Bad investigations got many others in trouble as we railed against abuse, everywhere we were with threat and much else to call people to order, though once I was on the verge of getting a very serious beating but I was spared. About 11 years ago, I used emails to friends to write about my life and many other issues with a religious slant; it probably ended up in their junk mail boxes as each day brought my nuisance to them; it was not sophisticated at all. Then on a long weekend holiday to Berlin, having heard about the new phenomenon of blogging over the previous months, I found a little hosting company in Scotland called Blog-City and I penned my first blog on the 8th of December 2003. Blog-City is now defunct, but it was a labour of love moving almost 1,500 blogs to its current location at http://akinblog.nl. Ten years down the line with over 2,200 blogs of stories, opinions, tales and silliness, I find I have a body of amazing work that I can be very proud of. And so goes the tale of how I got into writing and how it has become a way of life, of expression, a form of therapy and a joy of fulfilment. Yet, as I write, I know there are many more stories seeking the right level of inspiration and drive to be written – a book, they say, I must write, eventually. I express my deepest gratitude to the many readers, browsers, commenters and sharers who have come to my blog and found something to interest, inform, annoy or infuriate them – I would not have it any other way. To the next decade of useful writing, let the fun begin. 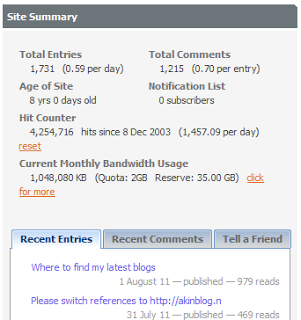 Blog - 4 years of blogging - Thanks!